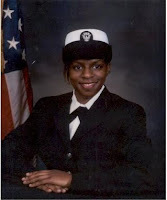 Angela Pearson recently sat down with From the Battlefield to discuss her journey from Supply Technician in the Army National Guard to Safety Regulatory Manager at Cargill, an international producer and marketer of food, agricultural, financial and industrial products and services. Currently, she is a Supply Sergeant in the Kansas Army National Guard; and she was previously a Yeoman in the US Navy, from 1995 - 1998. When Angela found out in October 2010 that the National Guard discontinued her temporary full time position, she connected with Orion and attended a Hiring Conference in December 2010. While she was interviewing with the Corporate Human Resources Manager for Cargill, he received a phone call. After finishing up his conversation, he informed Angela that a position had become available in the city and state in which she resided. "I was in awe and was totally surprised," recalls Angela, "I returned home, and, less than 24 hours later, Orion was calling me requesting a second interview with Cargill at the facility in my local city. I started with Cargill in February 2011." Angela credits her confidence and preparation for her Cargill interview to the first night of the conference that was spent doing interview preparation with Orion staff. The Cargill grain elevator in Kansas was Angela's first Cargill home as an Operations Supervisor. She found that her military background provided organization, discipline, leadership, and other values that made her a great fit for Cargill. When she learned that her father was ill, she was able to quickly transfer to a Environmental, Safety, and Health Supervisor position with Cargill in Dayton, VA, where she could be closer to her father. And while Angela had to learn to take a less stern approach with her employees, she found that doing so enabled her to gain trust and bring out the best in them. "I believe veterans bring much to the table of life and that of the workforce. We are already disciplined mentally and physically. Our organizational skills, along with leadership abilities, allow us to focus on getting the job completed correctly the first time around," explains Angela. Angela recently interviewed with Cargill for a Safety Regulatory Manager position in Fort Morgan, CO, and was offered the position. "It is an amazing advancement opportunity, and I thank Orion for their part in setting me up for success," says Angela. Her career has taken her from the Navy to the Army National Guard to a fulfilling, burgeoning career with Cargill. No matter what the MOS, branch, or status, veterans like Angela are finding great careers and are using their military skills to excel in those careers. To learn more about Angela's transition and career and to ask her a question, please click here.